Grand Central Publishing, 9781455547227, 272pp. Bill Geist--the beloved, award-winning, long-time special correspondent for "CBS: Sunday Morning," whose debut Little League Confidential was a New York Times bestseller in hardcover and paper--and Willie Geist, the Today Show host, popular member of MSNBC's "Morning Joe," and author of the best-selling American Freak Show--have begun an extended conversation between father and son on areas of mutual interest, agreement, and disagreement. Told in a unique back-and-forth banter style, the hilarious father-son team will laugh together at the shared journey of their relationship. They'll riff on fatherhood, religion, music, sports, summer camp disasters, driving lessons gone horribly wrong, being on TV, and their wonderfully odd family life. Think Big Russ and Me (May 2010, 345,829 net per bookscan) meets S*** My Dad Says, with humorous observations about professional wrestling as a worldview, raising a kid with television cameras in the kitchen, and anything and everything else that comes to their witty minds. The Geists decided to write this book so their children and grandchildren would have a record of their unusual father-son relationship. The book is remarkably funny, as well as poignant and sincere, especially in light of Bill's announcement that he's been diagnosed with Parkinson's. With its lighthearted look at the crazy things fathers and sons go through and the unique bond those experiences forge, the book is sure to be a must-have gift for Father's Day. 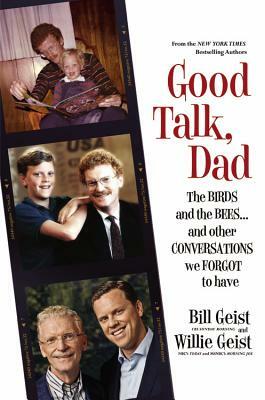 Bill Geist is the New York Times bestselling author of Little League Confidential, The Big Five-Oh, Fore! Play!, and Way Off the Road. He has been a correspondent for "CBS News Sunday Morning" since he joined CBS News in 1987. He chronicles some of the quirkiest people and places in America for the broadcast and has won two Emmys for his work on the show. To date, one of Bill's greatest achievements is taking third place in the Illinois State Fair Bake Off in 1979. Geist lives in New York City with his wife. They have two children. Willie Geist is the New York Times bestselling author of American Freak Show. He is co-host of NBC's "Today" 9 a.m. hour and the co-host of MSNBC's "Morning Joe." He is also a contributor to NBC News programs and to the NBC Sports Group, where he reports for NBC Olympics and NBC Sports Network. Geist lives in New York City with his wife. They have two children.